It is time to think about Spring Flowers. We want you to design a "Pot of Flowers" card. Selma used the Spellbinders "Flower Pots" (S5-060) dies or you can go over to SCS to this link for a tutorial on how to cut a flower pot card: http://www.splitcoaststampers.com/resources/tutorials/flowerpotpocket/. 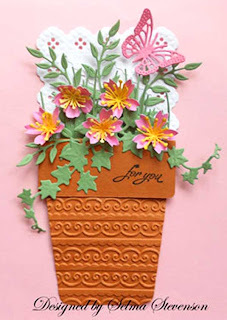 We want you to be creative and come up with a pretty pot of flowers card. You can fill it with any type of flowers you want. How fun! You can read all about Selma's card by clicking here! You will have until next Thursday (April 19) morning 6:00 AM EST to link your project. challenge and will be announced Friday April 20. This winner will win 2 bottles of Mica. The winner will also be entered in the end of the year $100 gift certificate drawing. 3. Or if you are posting to the SCS gallery, you will need to use a special code to tag your card to the challenge. This week's code is JG045 and needs to be posted with the challenge. Important, please have a direct link to your challenge card and not to your blog address. Comments always appreciated. I love seeing your cards! Thanks so much for playing!! So I've been trying to upload my card for hours now and it's not working over at SCS. I'm so disappointed, because I was finally able to play along again for the challenge. Oh well, guess I'll have to try again next week.